In many ways Northern Michigan is still a rugged and rustic place. I was surprised on my first trip to the area to see roads that were not paved. This is all part of the regions charm . 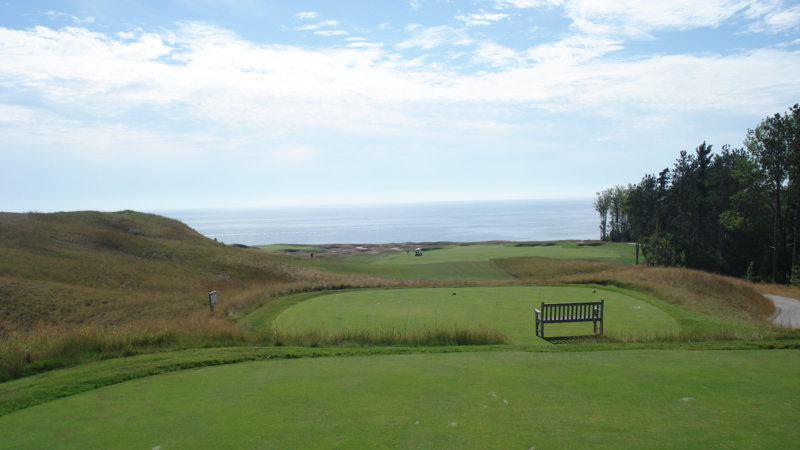 . . as is Arcadia Bluffs. This doozy of a course sits right on Lake Michigan as you can see in the photo below taken from the clubhouse. I’ve been lucky the two times I’ve played this course and the wind has not really been a factor. I hear that it can it can reach levels where you are hitting three or four extra clubs to compensate. Of course holes that are meant to be played with wind behind you, like the 16th hole, a 460 yard par 4, can be a real bear without that wind. I did manage to get there in two but then executed a perfect three putt. Though the course opened in 2000 it has the feel of a traditional seaside links style course. Natural fescue grasses all over the course make play difficult if you get off the beaten path. The course itself is manicured immaculately. The fairways are lush and nice and the greens roll true as can be. Speaking of the greens . . . they’re huge. I’m talking huge. I suspect that there are eight or nine available hole locations on these babies. They’re fast too, so when it comes to the long putts you sometimes end up with on huge greens its all about judging the speed. As you can see in the picture below the greens are not lacking contour either. I have no doubt that whomever selects the hole locations was a bully in grade school. 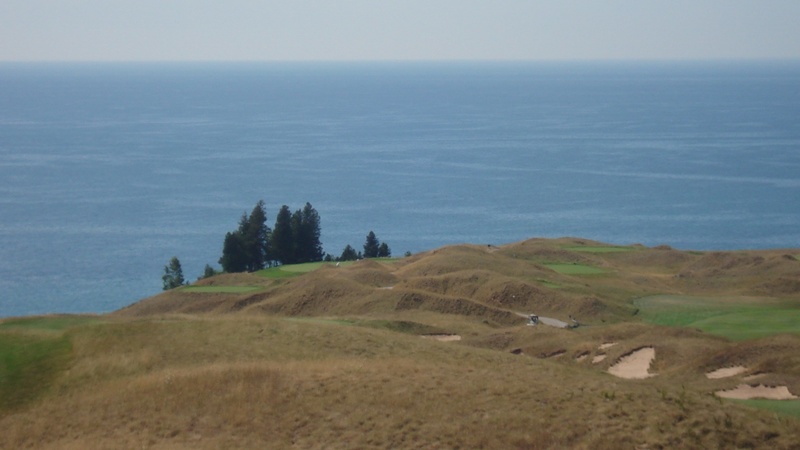 There are many great holes at Arcadia Bluffs. The course is literally built on the side of a cliff. The scenery is epic and every corner you turn brings a vista better than the last. Some of my favorites holes are the 4th (below) with its downhill drive towards Lake Michigan then slight dogleg right. The one shot 13th hole (below) with its 190 yard carry over a crevasse is another great one. You really cant be short here. In order to get a cheaper rate we waited until late in the day to tee off. The good news is that Northern Michigan summer days are long and teeing off at 4pm will safely get you back to the clubhouse with daylight to spare. For those still out on the course as the daylight fades a bagpiper stands at the top of the bluffs and lets his tune carry out over the entire course to warn golfers that daylight is getting scarce. This place is in the middle of nowhere, but it is well worth getting to. Playing against the backdrop of Lake Michigan is pretty fantastic and the course itself is a real treat. Don’t forget to bring some shag balls up to the 12th tee box to see how far into Lake Michigan you can hit them. Great blog! I just got back from a MI trip and found Arcadia Bluffs to be a blast. Next time you need to find a way to make it a little further up the road to Crystal Downs…it’s just about as good as it gets. ps- I think my best drive of the day was into the lake on #12 tee. Great blog. You are an inspiration. Just scored a round at Crystal Downs and will likely play Arcadia while I am up there. If you have any connections at Chicago Golf Club or Shoreacres send them my way! I am going to the American Club in August. I love Raynor too! Have fun at Crystal Downs. I hear it’s great. 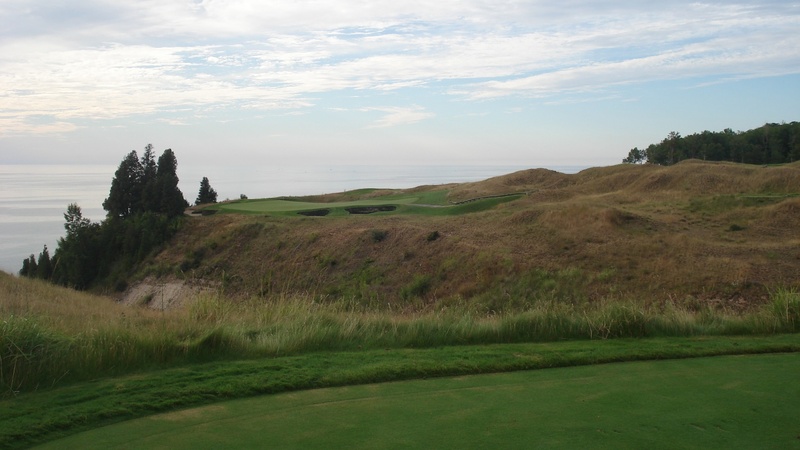 You should definitely also check out Arcadia Bluffs as well as Kingsley Club. I haven’t been to Kingsley yet, but I hear great things about it. Glad you enjoyed Arcadia and Lake Michigan – but please, to you and all golfers, do not hit balls on purpose into the lake. Lake Michigan is a precious gem to all of us in Northern Michigan and we know visitors don’t mean any harm by it, but hitting golf ball into the lake is pollution. 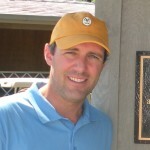 A lot of people might argue “a golf ball doesn’t hurt the lake” (which isn’t true – it does create a toxic environment) but no one could earnestly believe that golf balls are good for the lake. So in short, thanks for coming out, but keep your balls out of the lake when you can help it. Thanks! Arcadia is a blast with great panoramic views of Lake Michigan. One of the best places to grab a drink after the round as well. As a native person from Michigan, I would also highly recommend playing over at the Kingsley Club for people visiting this side of the state. 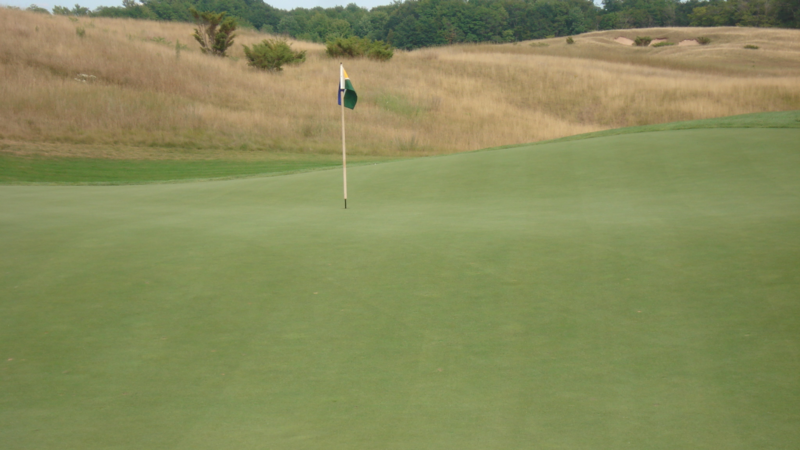 Kingsley is a great course with many similarities to Crystal Downs.